You can open your text files out of your GMX File Storage. Note, that only the following file formats are supported for word processing: .doc, .docx, .odt, .rtf, .txt. The file management for Online Office is done in your GMX File Storage. 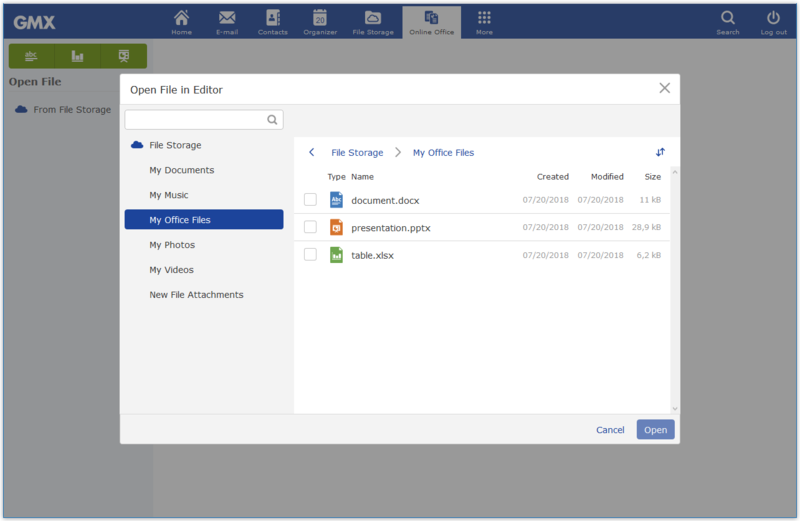 If you want to open and edit locally stored files in Online Office simply click Upload, select a compatible file and click Open. The file will then open in Online Office and will be saved in your File Storage. E-mail file attachments can only be opened and edited in Online Office once they have been stored in your File Storage. In the Open file section, click From File Storage. The dialog Open File in Editor will open. Navigate to the folder where the file is stored. Check the box next to the file or click on the file itself to select it and click Open. The file will be opened in Online Office.